Get 2 EuroMillions Bets for the Price of 1! By opening an account at LottoLand today you will get 2 EuroMillions bets for the price of 1. That's half the price that you would pay elsewhere. LottoLand’s mission is to bring dream jackpots to millions to people around the world. They are one of the biggest and most popular Lottery subscription websites in the UK with thousands of players. They also have many other websites operating around the world. The advertising on the website features popular TV presenter Chris Tarrant OBE. The website gives you the chance to bet for millions in jackpot cash on the UK EuroMillions, UK National Lottery, USA’s Powerball, MegaMillions, Scottish McLotto, IrishLotto, and Europe’s Euro Jackpot draws. 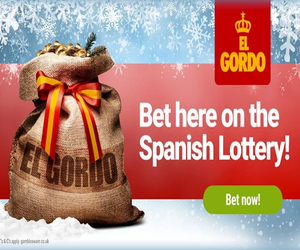 In the run up to Christmas, you can also bet on Spain’s huge El Gordo draw where you can win up to £2 billion in prizes. By betting at Lotto Land you don’t play in a syndicate but after the initial promotional period, you can choose to subscribe to any or all of the lotteries for between 1 and 8 weeks. By betting through a subscription means that you will never miss a draw. Statistically speaking the longer you play with the same set of numbers will increase your chances of winning a prize. As well as just subscribing in each draw you can choose from a number of special features that will help you to win the most money possible. One of these features is called ‘Participation from Jackpot.’ By activating this feature you can postpone when your numbers are entered into each draw until the jackpot is at a certain amount. So if you only wanted to enter draws where the jackpot was 100 million euros then the participation from jackpot feature would do exactly that. Other special features include the double pot feature. If you win the jackpot and have activated the double pot then you will win double the amount on any lottery you choose. You can also choose the system combo feature on the EuroMillions lottery. Simply pick 5 main numbers and the combo feature will automatically pick every possible combination of lucky stars for you. The more lines you have in as many combinations as possible the more chance you will have of winning millions. Opening / Special Offer: By opening an account at LottoLand today you will get 2 EuroMillions bets for the price of 1. That’s half the price that you would pay elsewhere. Winnings: If you win a prize then any winnings will be credited directly to your account. You can then use your winnings to buy additional tickets for any draws or you can withdraw your money directly to your bank account. hey excellent post I won £5,000 on the thunderball last year.